Will I Lose Everything I Bought With Credit Cards If I File for Bankruptcy? Bankruptcy expert Leon Bayer answers real-life questions. I am getting ready to file bankruptcy. What happens to all the stuff I bought using my credit cards? Every single thing I own was bought during the past ten years using credit cards and department store cards. I mean, the shirt on my back down to the socks on my feet, to this computer, the tires on my car, the bed I sleep in, and the desk and chair I’m sitting in. Does all of it get taken away? 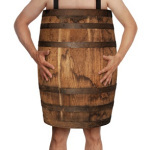 I have this silly cartoon image of myself left standing in a barrel because everything, including my clothes, gets taken away when I get to court. I have awesome news for you. There is a hardware store close to the bankruptcy court and they’re having a big sale on barrels. On your way to court, buy the one you like. But don’t pay with a credit card. Seriously, the image of people walking out of bankruptcy court wearing barrels is something we won’t ever see. In most cases you don’t have to give up the things you bought on credit. Although there are some exceptions. A security agreement is the same thing you have when you get a car loan. Your debt is “secured” by the item you owe the money for. The item you buy serves as collateral for the debt (it’s as if legal title on the item is being held hostage until you finish paying for the item). If you don’t pay as agreed, the creditor can repossess the item because you don’t yet own it. Major credit card issuer. Ordinarily, there won’t be a security agreement if the lender is a major credit card issuer like Visa, Mastercard, or American Express. Store cards. Usually, there will be a security agreement if the lender is a department store, like Best Buy or Macy’s, or a jewelry store. What Happens to Items Subject to a Security Agreement? When you file bankruptcy, the creditors with security interests are entitled to either get paid or get the property back. But often you can keep the property, for several reasons. Creditors rarely repossess items that are old or obsolete. For practical information on negotiating a good deal on property you want to keep in bankruptcy, see Tips for Getting a Great Reaffirmation Agreement in Bankruptcy. When Do You Own an Item You Charged? When you make a payment towards your department store account, the store credits the payment against the oldest unpaid balance. When you have paid off the oldest item, you own it. The store then applies your next payments to the next oldest balance, and so on. Items you charged on your major credit cards belong to you, not the store, because the major credit card bank has already paid the store for you. Your major credit card debts will normally be discharged in bankruptcy, and all the stuff like ordinary appliances, furniture, barrels, and clothing will be your “exempt” property. Leon Bayer is a Los Angeles bankruptcy attorney. He is a partner at Bayer, Wishman & Leotta, a California law firm specializing in bankruptcy. The opinions and advice in this blog post are from Mr. Bayer alone, and should not be attributed to Nolo. By answering a question on this blog, Mr. Bayer does not become your lawyer. by: Albin Renauer, J.D. , Attorney Stephen Elias, Robin Leonard, J.D. by: Attorney Margaret Reiter, Robin Leonard, J.D. by: Attorney Stephen Elias , Robin Leonard, J.D.